Camilla's paternal great grandfather is unknown. It is doubtful she is the great granddaughter of Alice Keppel's husband. There were rumors Alice Keppel's daughter and Camilla's ancestor were a banker or King Edward. I doubt it will be definitively determined. Perhaps Camilla Ihas already done DNA testing and knows? I know I would want to know. I want to thank everyone who helped me. You all are great! When Charles is King, do you believe he will make several visits to countries in the Commonwealth? Unless he is already in his mid-late 80s I would expect him to visit at least all the other realms within the first two years of becoming King. He'll go all over the place and revel in being feted as King; I am certain that he'll go to as many countries as he can to get the plaudits. IF the DM article is any indication, there will be promotion of Camilla to sainthood during his reign. Charles and Camz are not wanted in many Commonwealth countries. Where does Prince Charles get his official royal stationery from? Likely Smythson, I think they (the whole family) have used Smythson's for ages (ie generations). Liz the queen mum is said to have used Crane's though, a US brand. Is Smythson's based in London? ^ Yes, it is. An old English brand, dating back to the late 19th century (it was created in the 1880s) and supposedly used by Victoria. They have gorgeous stationery! And the price to match. They also all seem to use fountain pens, which isn't that great a novelty in Europe tbh. The best way to do handwritten correspondence is with fountain pen and half decent paper anyway Liz uses still an old Parker 51 she's had for about 70 or so years! (though not only that one, she's really not that frugal). ^Smythson's sounds like a wonderful place to visit. The stationery would be marvelous to see. I truly do think that if Charles would have gotten more of an education (with his time and money on his hands, it would in fact be easy to balance schooling with duties) and would stop marketing himself as a harmless old codger, I am certain that it would be best if he would STOP trying to be loved by his people. He needs respect, not love at this point in time and he is lacking in both. He had a fine education - university degree followed by military service followed by a life of duty in support of the Queen. There was an entire council of advisors to the Queen set up to advise on how to educate Charles and that advice was followed. The council included the PM and Archbishop of Canterbury at the time. Since he left the navy he has been working full-time for his mother ... and the recent documentary made it clear just how hard he works to the point that his sons were saying they had to wade through papers to get to him to say good night and he often fell asleep while working at his desk. The hand-shakes and waving is the visible side of the monarchy but they do a lot more behind closed doors. He has also ensure that he has been advised by the best experts around and reads widely on many subjects. People who have been invited to talk to him on their areas of interest have all said how informed he is before they even start. A piece of paper doesn't mean an education. There are many other ways to get educated and Charles has followed them - by pursuing a life-long education. He was speaking on environmental issues in the 70s and was laughed at but now - 40 years on - we are actually agreeing with his ideas - far from a 'silly old codger' he is a man ahead of his time. He did not get the best grades. The military service was not the best--he crashed a plane and got an anchor caught on a cable. The royals DO have to be seen working, the behind closed doors cannot be what they get by on. Charles has had very questionable mentors. Like Van Der Post and he was an admirer of Armand Hammer. Mountbatten was more self serving when he advised Charles. Charles acts like he was the first to speak about the environment. He wasn't. It was actually Rachel Carson whose Silent Spring was a groundbreaking book. He does act like a silly old codger on his appearances, pointing and giggling. Not a good look for him. The first Earth Day took place in 1970 before Charles started expounding on it. It was easy for Charles to promote organic farming despite crop losses; he didn't have to rely on a good crop to feed his nation and second, he had the taxpayer catching him when the crops failed. Now these dimwits call it "eccentric spelling" and "15th century English", I just cannot today with the fail. This must the failiest fail's lowpoint ever. They've hit the rockbottom of stupidity, esp. for alleged "writers" and "journalists". Has any of those people ever read a bloody book or article by a British writer in recent times? ffs!!!! Absolute bloody dimwitted, imbecilic *fools*. Where did this rumor come from? 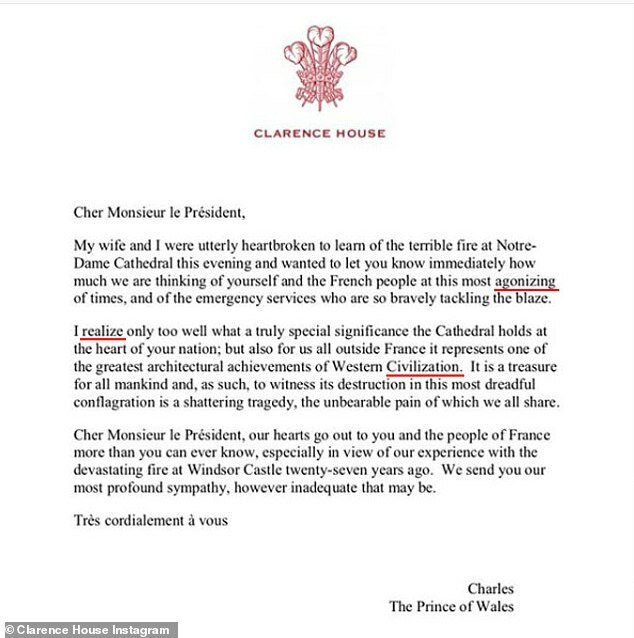 Why would she write Charles' letters? And why would he want that? ^ Just because the Sussex Instagram account features some American terms (like "diaper" instead of "nappy" and stuff like that) and "spellings" (which is not true, as established, "ize" and "ise" is correct in British spelling). The dimwits thought they caught Chuck using some American for his PR letter and instantly pinned it on Markle. They thought they had a juicy story, but all they did was show everyone how dumb they are about grammar and spelling. Which is an open secret (can't even call it that, really, but let's roll with it). These fools wasted a whole stupid as fck article on this absolute non-issue, which could've been avoided if these m*rons had invested into a 5 second google search ("ize vs ise spelling"). I am so so annoyed by this, you won't believe, I don't even know why this has me so vexed. I mean this is some minimum knowledge and these "journos" and "writers" have no frikkin clue and 98% of the commenters don't either. Just glad a sane comment with a proper explanation has managed to become (almost) the top comment. As said, they should have criticized the faulty use of commas (the Oxford comma only applies to lists, not regular sentences) and the lack of commas as well with excessive "ands" as well as this stylistic stupidity: "we are thinking of yourself and the French people" when it should be "we are thinking of you and the French people". FFS. Just glad they had fun with their red Sharpie underlining utterly useless words and non-existent faults. But the other mistakes go over these idiots' heads clearly, as the ize vs ise "issue" was already too much for their dim faculties. PS It's just the 1st paragraph which needs work, cancel at least one "and" and keep the comma, and strike the "yourelf" and replace with "you" and boom, done. PPS Just took another look, in fact it'd be better to put a few full stops into that first paragraph, it's a monster of a sentence. Who the F wrote this? Not willing to look at it any further, but it needs a bit of work (again, only the 1st paragraph, rest seems fine). No way would Charles let anyone write letters for him. He's not the type to do so. Exactly. Chucky is too pompous to let anybody write his fabulous speeches.